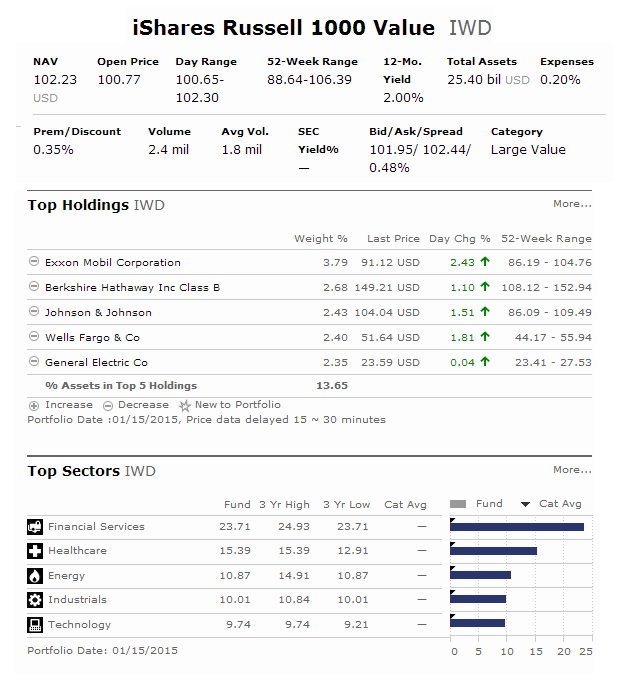 iShares Russell 1000 Value ETF (IWD) is an index stock ETF (Exchange Traded Fund). This equity fund is investing in large U.S. companies that are thought to be undervalued by the market relative to comparable companies. Its objective is to track the investment results of an index composed of large- and mid-capitalization U.S. equities that exhibit value characteristics. This stock fund provides low cost access to this index in a single fund for U.S. stocks. This iShares ETF has a higher dividend yield than regular ETF with 2.00%. The total assets are $26 billion. As one of popular ETFs, this large value fund has an expense fee of 0.20%. Its current share price is $102.23. This fund price has 52 week range between $88.64-106.39. You can buy this popular ETF through your brokerage for retirement or regular investment account. For 401k, please check with your administrator. Invest in ETF can be done with as little as 1 share (i.e. less than $105.00 per share). Morningstar has ranked this U.S. stock ETF with 4 stars rating. In 2014, the total 1 year return is 13.17%. The 3 year annualized return is 18.57%. This popular ETF has returned 10.80% over the past 1 year, and 14.09% over the past 5 years. As of December 2014, top 5 stocks are Exxon Mobil Corporation (XOM), Berkshire Hathaway Inc Class B (BRK.B), Johnson & Johnson (JNJ), Wells Fargo & Co (WFC), and General Electric Co (GE). Top 5 sectors are financial services, healthcare, energy, industrials, and technology. iShares Russell 1000 Value ETF has low expense fee of 0.20%. You can diversify your investment portfolio using this ETF.